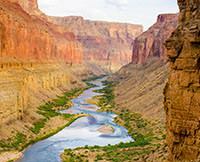 My Grand Canyon rafting trip was an unbelievable once in a lifetime experience. My June 30th Grand Canyon Rafting Trip was great and our guides were fabulous. Evan and Jeff were AWESOME (the guides on my boat). Ronnie and Scott were great too though I didn't see as much of them as Evan and Jeff. I really loved all the "river lore" and geology they shared. The poems and stories were nice touches. Could't have asked for better guides. Wow. This was an unbelievable once in a lifetime experience. I am so happy I went with Western River -- observing their setup (boats) versus others we saw there was no comparison. I wouldnt hesitate to recommend them to everyone.